Throwing a bachelorette party for the bride can be quite nerve wracking. 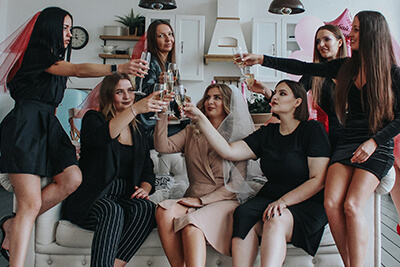 Calling up all the girlfriends and getting everybody together is just part of the stress, but the main concern when having a bachelorette party is planning all of the events and activities. With all of the fun and exciting things that you can do for a Detroit bachelorette party, it's easy to get overwhelmed and have a hard time deciding on the plans. If you have a bunch of activities and places to go, you always have the option of renting a party bus. With a party bus, you won't have to worry much about transportation, driving, or directions. Instead, you and your friends can all sit back and enjoy the ride, ensuring that the party doesn't stop just because you have to change venues. Here are some ideas for throwing a Detroit bachelorette party to remember. I'm sure you have heard all about people doing pole dancing at home over the past few years. With portable poles becoming so cheap, you can easily have one of these in your home to play around with. Not only is this a great workout and fun, but it can bring some sparks to the bedroom for you and your partner. There are a few places across the metro Detroit area that offer pole dancing and lap dancing classes. One company that we recommend is Vixen Fitness. Not only do they offer a studio that you can go into to learn pole dancing or lap dancing at an affordable rate. But they can also come to your home and give the lessons there. This would be a great kickoff to do before hitting the town for your bachelorette party in Detroit. You and a group of girls can also take the party bus to the studio for your lessons. A great way to start off your bachelorette party is to begin the day or evening at someone's home. Whether it's the home of a relative, a friend, or the bride herself, starting the party at a house is a good way of getting everyone together for some quality time. The house can also serve as the meeting place for the group. While at the house, everyone can settle down for a meal, a light snack, some drinks, and gift-giving. You can even iron out some of the kinks in the bachelorette party plans, if needed. Have the limo bus pick up you, your girlfriends, and the bride, and you can continue the party on the bus as you travel to the other Detroit bachelorette party venues you have planned. Every bride deserves to be pampered and what better way than to have a day at the spa. Take the party bus to one of the many spas around Detroit so you and the girls can be treated like princesses. Make sure to contact and make reservations with the spa ahead of time to make sure that everyone can be accommodated. You may even be able to get some of the special spa packages that come with a full range of relaxing spa treatments -- from facials and foot spas to massages and mud baths. In fact, some spas even have restaurants, cafés, or bars in them in case you and the girls get hungry or thirsty. Whether you decide to have the spa for the main party event or as a precursor to the many events to come, you can be sure that you, the bride, and the entire group will be relaxed for whatever lies ahead. You can also hire a massage therapist and do an in office visit or even get someone to come onto the bus and perform the massage wherever you want. Caryn Cart from Ann Arbor Massage will travel anywhere in metro Detroit or Ann Arbor to for a massage and she will also be your mobile massage therapist if you decide to rent a party bus. Girls and guys alike can appreciate the fun, adventure, and relaxation that a weekend getaway entails. Make reservations for a weekend of excitement at a hotel or resort. The advantage of having a party bus for a weekend trip is that you won't have to make schedules and plans for transportation. All you have to do to get the party started is book reservations and get everyone on the limo bus. You can even stay at one of the hotel-casinos in and around Detroit for those who enjoy gambling. With the countless amenities that they fit into hotels and resorts these days, you can find activities for people of all ages and varying interests. Another great idea for a Detroit bachelorette party is to rent a place to stay, where you can do anything you want. Rent a beautiful, lakeside property or luxurious, downtown apartment and have the party of a lifetime. You can even decorate the place to your liking for the party or rent some speakers and lighting to bring the club to you, instead of going out to a club crowded with people you don't know. Use the party bus to pick everyone up and bring them to the party. You can even take the party bus for a spin around downtown Detroit, while continuing the partying, drinking, dancing, and all-out fun on the bus. The best part is, the girls can spend the night if needed, so there are no worries about having to find a way home. One of the popular options for the Detroit bachelorette party is to have a girl's night-out. Take the bride for a ride in the limo bus and drop by some of the city's best clubs, bars, and night-spots. With some of the most interesting nightclubs, performances and events in the country, “Motown” Detroit has a vibrant night-life. You and the girls can have the time of your lives experiencing lights, sights, and sounds of Detroit. Interesting atmospheres, a wide variety of cocktails and drinks, mesmerizing lights, and some of the best music in the world make for a memorable and fun Detroit bachelorette party. Throwing a theme party for your bachelorette party is a good way to get everyone involved in the festivities. You can have a Mardi Gras party with colorful beads, creative masks, and the decorated outfits to match. A pajama party with yummy food, good movies, and fun games is another idea for a theme party. Try to make sure that the theme is something that the bride would be interested in and willing to dress up for. Also, don't hold back on the decorations. Try to fulfill the theme as fully as possible to make it a truly enjoyable and memorable bachelorette party. Wherever you decide to go and whatever you decide to do for your Detroit bachelorette party, always remember that the main goal of the party is to make the bride's last unwed days her best. Try to make plans that everyone will enjoy taking part in, especially the bride. Above all, keep in mind everyone's safety and comfort to ensure that everyone gets home from the party safe and sound. Every woman deserves to be treated like a queen, so, even if it's just for the night, try to make the bride feel like one.